Update: Sorry, there is no such offer for real UO faculty. UO is planning to lay off ~75 non-tenured and pro-tem faculty in RL, AAD, CoE, and the SOJC with no buyout at all. The [shameless PR flack Craig Pintens press release] added that Moore will work remotely to craft a transition plan to ensure the the program’s success going forward. Meanwhile, Provost Coltrane’s academic budget is still subsidizing the Jock Box to the tune of $2.4M a year, we’re paying Mullens $500K a year for Frohnmayer’s Mac Court land scam, and don’t get me started on the overhead. This opinion was very useful back when Gottfredson was President, and UO was trying to hide information about the Willie Lyles scandal. The Daily Emerald has the scoop here. But they’re only UO faculty in the alternative-fact world of our General Counsel’s Office, so that they can hide their personnel records from public records requests. They’re really Duck volleyball coaches. Tagged athletics subsidy, Go Ducks, Public Records. Bookmark the permalink. is having to trim their NTTF. 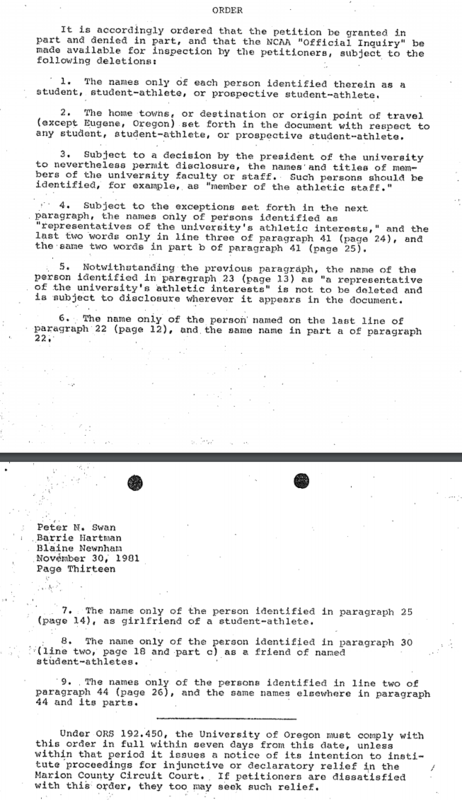 For the life of me, I don’t see why UO faculty personnel records should be any more or less confidential than those of other staff members. I assume the Oregon law goes back to academic freedom and the red scare, or maybe faculty participation in Vietnam protests. So far they’re still on the payroll. I think they have some basketball program “dirt” that they’re using to bargain their way out. Or, is it football? The comment above is unsubstantiated gossip of the most despicable sort. It is a well known fact that the Duck basketball and football programs are pure, clean, and entirely free of “dirt”. Exactly. I’m sure another opportunity for it will come up. People usually justify outlandish football coach salaries because they bring in revenue, even though their salary as a fraction of revenue is enormous compared to other occupations. But what is the justification for paying a volleyball coach $175k plus perks? I have almost been trained to think of that as a reasonable amount… after all, it is not millions of dollars. He is, though, one of the highest paid “faculty” on campus, for overseeing a small and insignificant operation.